This year’s Louisiana 5th congressional district race isn’t the only instance of Phil Robertson (of Duck Dynasty fame) venturing into the realm of politics, but it’s probably the first time he’s championing a family member for public office. Robertson has endorsed his nephew, Zach Dasher, for Congress – and he’s even cut a couple TV ads to help promote his sister’s boy. Not bad for a guy who’s always been about keeping it in the family. Following Robertson’s lead, ConservativeHQ.com is formally endorsing Dasher as well – not due to his membership in a famous family, but because he’s the principled conservative in the race. And with Louisiana’s unique “jungle primary” system, Dasher would only need to finish in the top two vote-getters on Election Day next week to force a run-off (on December 6th). Robertson and family had previously supported Rep. Vance McAllister, but broke with the congressman after McAllister was seen earlier this year (on video) kissing a married former staff member. Hence, McAllister became known as the “kissing congressman” and the Robertsons felt they could no longer back him. Fans of Duck Dynasty know the Robertson clan is eternally suspicious of politicians and anything related to the establishment, so Dasher should represent a refreshing change for the self-described bearded brethren. The second ad is called ‘Vetted.’ In it, Robertson says “On Tuesday, Ms. Kay and I are voting for Zach Dasher. He loves his family, he's got a servant's heart, he knows his Bible. He is a good man. We vetted him." Dasher has other high-profile endorsements as well. Sen. Ted Cruz also recorded a video endorsement, seen here. 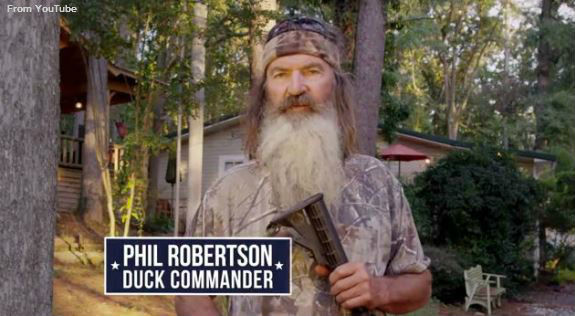 Like Phil Robertson, Cruz urges Pelican State voters to pull the lever for Dasher. “Zach Dasher is a conservative with a backbone to stand up to career politicians in both parties to help lead the fight to repeal Obamacare, to stop amnesty, defend our conservative values and turn our country around,” Cruz argued. Gov. Sarah Palin and the Family Research Council’s Tony Perkins (a Louisiana native) have also endorsed Dasher, completing a pretty impressive who’s who list of the conservative movement to highlight the race in the 5th congressional district. Si may be the crazy uncle on the TV show, but he’s 100% correct in terms of the threat posed by the liberal agenda. Polls show a tight race going into next Tuesday’s primary. Republican Ralph Abraham led the latest poll with 24.5 percent, followed by Democrat Jamie Mayo (Mayor of Monroe) with 18.3 percent. McAllister shows 15.7 percent, then Dasher with 15.1 percent (a 4 point improvement from the previous poll). It should be noted that the poll was taken prior to the airing of Phil Robertson’s ads or Ted Cruz’s endorsement. The 5th district is fairly conservative, so the new efforts could very well be enough to push Dasher into the December run-off. As previously mentioned, the Robertson family campaigned for McAllister during the congressman’s initial run last year. McAllister said he would resign after the kissing video surfaced, but then changed his mind – which didn’t please the Robertsons very much. Phil said "the last dude last year fed us a lie.” The congressman probably would have been better off keeping his vow to stay out of the race. The Robertson family has emerged as a popular social icon in America and you would have to believe their say will carry weight with local voters in Louisiana’s 5th district. We here at CHQ feel the same way about Dasher and hope others will see him as the best opportunity to carry the conservative message forward in Congress, starting in January.